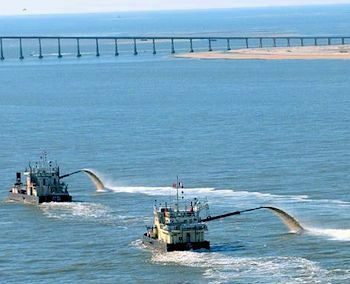 Dare County has chosen for the public-private partnership a contractor that will build and operate a dredge to maintain Oregon Inlet. One of two companies to respond to the county’s request for proposals, EJE Recycling of Greenville was chosen over a Massachusetts-based company primarily because of its experience working the inlet and its plans to base and maintain the dredge locally. Dare County and EJE will work together to find a builder for the vessel. It would probably be a hopper dredge like the Army Corps of Engineers’ 150-foot Currituck or 156-foot Murden, which both work the inlet. But a combination dredge would also be considered if it can be designed and affordable, Outten said. EJE’s competitor, Cashman Dredging, is a larger company. 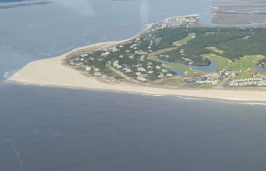 But it could not promise to base the dredge on the Outer Banks. Another advantage is that the leader of the EJE division handling the project has long experience in the inlet with the Corps. Dare County and North Carolina have since picked up the slack by paying the Corps to clean out the channels with its limited fleet.